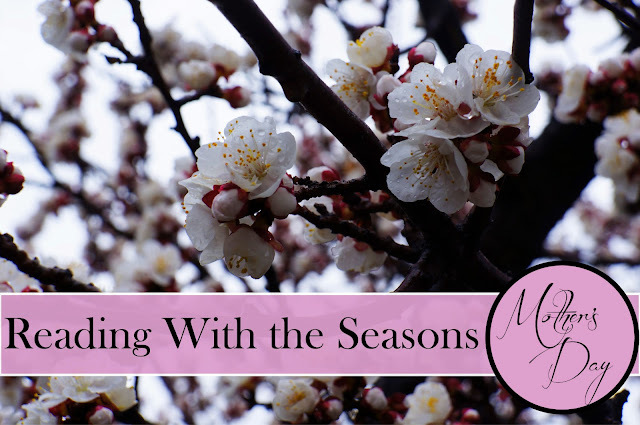 Was anyone looking for Reading With the Seasons last month as Spring made its grand entrance into 2013? No? Well, no matter. I'll console myself with the knowledge that there was one person wondering where it was--my brother, Gordy. He's the one whose photographs I featured in the New Year's and Valentine's editions, and I asked him if he would also like to contribute to my spring post. He sent me a couple pictures and then noticed several weeks later that I still had not put up anything. However, when it comes to Mother's Day, I happen to be bursting with good books to share, so I'm going to move on past spring and share what I'll be reading (or have already read) to help me feel more appreciation for the women in my life and remember how blessed I feel to be a mother. I read this book right after I had Bradley. I don't know how I would feel about it now, but I loved it then. It was exactly what I needed as I navigated the tricky transition from two children to three. It helped me view those frantic and chaotic days through a humorous, realistic, joyful, and even spiritual lens. I actually just finished this book last week. Look for a full review of it soon. Linda Eyre is the mother of nine children, so she is able to offer down-to-earth, in-the-trenches, very practical advice. It gave me a little pick-me-up as well as some ideas I'm excited about implementing. This book has been on my to-read list for a long time, but my interest in it was recently rekindled when Melanie mentioned it as a book everyone (man, woman, and wildebeest, as she put it) should read. This one comes highly recommended from my friend, Sarah. It is all about how to simplify and balance all of the daily demands in order to truly get the most out of life. I could definitely use some help in that area. I know absolutely nothing about this book, but the title was enough to pull me in and want to give it a try. Maybe some of you already saw this as an advertisement on the sidebar of Goodreads. That's where I saw it, and it looked interesting enough that I added it to my to-read shelf (don't worry, it's only #277) and am also telling you about it. It's the memoir of a mother of a child with Down's syndrome. My friend, Holli, has been trying to get our book club to read this for months. I'm going to push for it in May because it seems like the perfect Mother's Day read: It is short and is written in the form of a letter from the author to her children. I honestly have so many other books I could add to this list, but these are the ones that I have the most interest in at this moment in time. You might notice though the lack of fictional books on this list. That isn't because I don't think there are some great mothers in fiction (Marmee from Little Women immediately comes to mind), but I was having a hard time thinking of very many. So I hope you'll share your own favorite mother books (fiction and/or nonfiction) in the comments! P.S. Given my introduction, it probably goes without saying, but photo credit goes to my brother, Gordy. Lovely list and photo sugar! It's funny but most of the books that make me think of spring I read in the "springtime" of my life, ha ha. Of course, as you said, The Secret Garden is pretty much the first that pops into my head. But I also think of Charlotte's Web, Caddie Woodlawn, Tuck Everlasting, Heidi, Anne of Green Gables, The Adventures of Huckleberry Finn. I guess I feel like spring is the time to read classics. Not all of these books take place entirely in the spring but all of them have a love of nature in them. I'm having a hard time coming up with any "older" books that I feel like reading in the spring. I have been wanting to start reading Beatrix Potter with my girls again... but that's going in the other direction. I'm interested to see what people come up with because I too love reading with the seasons! Sorry to post twice but I just realized that I left out one of my favorites that would be perfect AND is more adult-ish (but would be great for teens too), "All Creatures Great and Small" by James Herriot. SO GOOD. Sarah - I've been meaning to read that one for a long time now...ever since you started praising it (maybe even before that, since I know my mom really likes it, too). And your other suggestions definitely evoke a feeling of spring. I think these all sound great! My aunt, Susan Law Corpany, actually wrote a hilarious book about her own experiences as a mother (and memories of my grandma) called "Musings on Motherhood" that I would recommend.